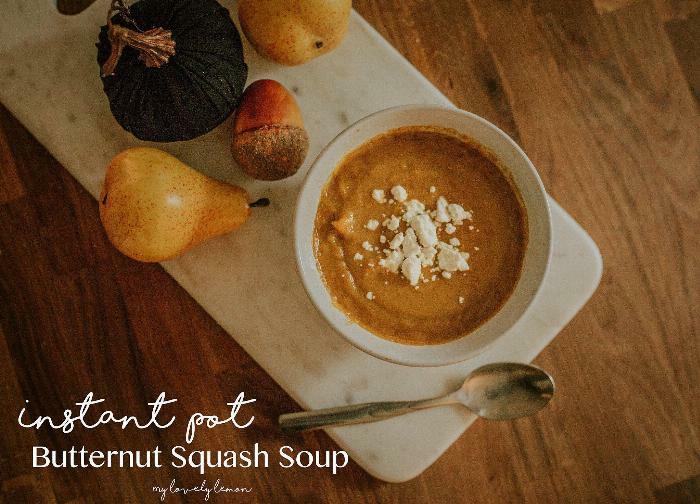 Delicious soup for Fall evenings. Hints of pumpkin spices and apple give it a delightful and cozy feel. 1 butternut squash, peeled, seeded and diced into cubes. 1Set the Instant Pot to sauté and add olive oil. Once the screen reads "hot" add onion and garlic powder. Cook, stirring occasionally until onion begins to soften, 3-5 minutes. 2Add squash and potato, and stir to combine. Cook another couple of minutes until squash begins to soften, stirring occasionally. 3Press the cancel and then add all other ingredients, Stir to combine, then tighten the lid on the pot. Ensure vent valve is set to "sealing." 4Press the "Manual" button, and set the timer to 10 minutes on high pressure. Once completed cooking and the pot beeps, let pressure release naturally. Remove lid once pressure has released. 5Using an immersion blender, purée soup directly in the pot.